Made by Miller Fluid Heads, 1954-1958. Notice how smoothly movie cameras manage up-and-down tilts and sideways pans. This ability owes a debt to the inventive talent of Sydney’s Eric Miller. In 1946 Miller proposed a solution to replace the complex gears, counterweights and gyroscopes that were attached to movie cameras to smooth out their movements. Camera tripod with head, fluid mount, Miller type C, metal/wood, Miller Fluid Heads, Australia, 1958. Fluid head (black cylinder) mounted laterally on wooden tripod. Attached at right angles centrally to cylinder is another cylinder with a cam mount and various adjustment screws. Marked on camera mount: "THE MILLER HEAD" PAT PEND. 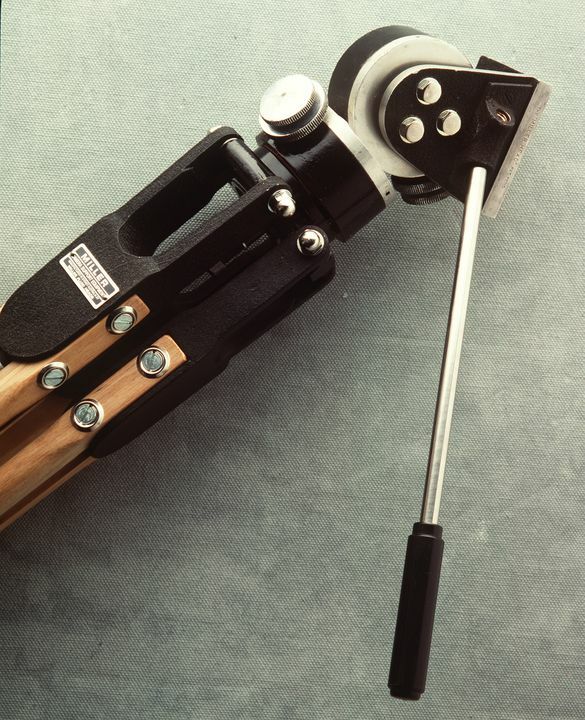 ", plaque on tripod marked "MILLER/ CAMERA SUPPORT EQUIPMENT/ Manufactured in Sydney Australia by/ MILLER FLUID HEADS"
The first smooth camera tripod head available to the film industry enabled simultaneous pan and tilt camera movement for the first time. This Australian innovation was designed and then patented in 1946 (Australian patent number 130,757) and published in 1947. The tripod mount was made in 1958 by Eric Miller, of Miller Fluid Heads, in Australia and subsequently exported to the USA, Europe & Canada. It was used extensively in the Australian film & television industry from 1956. Miller heads (new ownership from 1971) are still made for export and considered a 'world brand' within the industry. The fluid head camera mount was invented in Sydney by Eric Miller. In 1948 Miller proposed a solution to replace the complex gears, counterweights and gyroscopes that were attached to movie cameras to smooth out their movements. It took six years to perfect and patent his 'viscosity drag' principle which uses drums sealed inside pressurised fluid-filled compartments inside the camera mount. The fluid in the mount resists the movement of the drums when the camera is still and resists sudden stopping when the camera is moving. The result is smooth pans and tilts. Miller fluid head mounts and tripods are made in Sydney and sold in around the world. Powerhouse Publishing, Sydney, 1993, pp 60-61.